OzBass Members' gigs - go on promote yourself! I've recently been recruited to Night Radio who will be playing at the Excelsior Hotel at Glebe (NB NOT in Surry Hills) on 14 December. Here is our myspace: http://www.myspace.com/nightradio . Don't expect funk or rock for this one (we save that for another incarnation). Anybody else doing gigs? Let us all know! Re: OzBass Members' gigs - go on promote yourself! Sadly just private gigs at the moment (although the money is good!). Will definitely mention it for the next public gig. Oh, I think we may be playing at some carols thing in Camden on Friday week, probably upbeat jazz stuff... but who wants to trek out to Camden! A gig is a gig and you never know who is going to be there. My band Crosstown Traffic (blues/funk/classic rock jam&cover band) playing at The Australian Hotel (Richmond/Windsor area) 12th Dec! Around 7.30pm til 12am...be there! Also my jazz/soul/blues quartet "BLACK COFFEE" is doing The Queens Head BAr & cafe Every Sunday 6.30-9pm USe mainly my MARK BASS LMII(tho sumtimes my V4BH) into either Aguilar GS112 or GS115..... playing my modded PALATINO EUB & Fender AM series S1 Jazz. Last edited by rodl2005 on 02 Dec 2008, 12:53, edited 1 time in total. oliver wrote: Sadly just private gigs at the moment (although the money is good!). Same here. 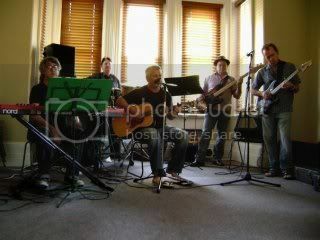 Though we do have one public gig in December - Sat Dec 27th at the Oatley Hotel, 8.30 start. Very much a retro band with a "Medley" gimmick and a very tongue-in-cheek vibe. I'd love to see a pic of you and your worship band if you have one. Phil wrote: I'd love to see a pic of you and your worship band if you have one. JUst a reminder to any TASSIE playa's out there!!! Hey guys...lot of progress on the Fading Hour front. Our debut EP, Beyond The Void will be released on Dec 20, at The Espy Hotel, Gershwin Room. Hope to see you Melbournians there!! I have cheap $10 tickets available. Email jbach@internode.on.net for more info!! We're pioneering the "Scofield Set" idea tonight. Our instrumental set is entirely John Scofield songs, but I doubt anybody will care or notice! Everything else is suitably loungy/dancey/funky/souly, so it should be fun. It's open to the public but at $500 a ticket, I won't be offended if no-one I know comes along. As one of my friends said - "For that price, I'd expect the band to be the Rolling Stones"!!! Got a lot of good comments from the (admittedly drunk) partygoers, sounds like a lot of them are keen to have us play at other functions so it turned out well. We got a pretty damn good sound as well, which we were happy about.